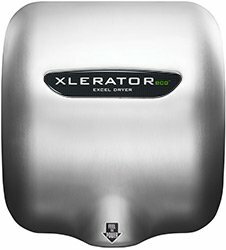 The automatic XLERATOReco XL-SB-ECO 110/120V hand dryer has a brushed stainless steel cover, and is surface mounted. It can be recess mounted with the optional ADA recess kit. Manufactured by Excel Dryer, the Eco series of Xlerator hand dryers, do not have heating element to heat the air, but will still air dry hands in 15 seconds. The environmentally friendly XleratorEco only requires 500 watts of power, allowing for the installation of up to three XleratorEco units on one 20 amp circuit. The 1.1 Noise Reduction Nozzle comes standard on all of the Xlerator hand dryers we carry. View More In Hand Dryers. If you have any questions about this product by Excel Dryer, contact us by completing and submitting the form below. If you are looking for a specif part number, please include it with your message.